Hong Mei Pang is the Immigrant Rights Community Advocate at Chinese for Affirmative Action. 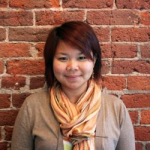 Prior to that, Hong Mei was the ASPIRE Program Coordinator at Asian Americans Advancing Justice- Asian Law Caucus. She spent several years in New York City where she graduated from The New School and cultivated a strong passion for community organizing. As an undocumented API youth, she has been actively involved in community organizing and is a co-founder, member and previously the Lead Organizer at Revolutionizing Asian American Immigrant Stories on the East Coast (RAISE), affiliated with Asian American Legal Defense and Education Fund. She has also worked with Damayan Migrant Workers’ Association and their youth program, serving Filipino children and youth whose parents are domestic workers and trafficking survivors.